Our client’s new product for the treatment of human immunodeficiency virus (HIV) had just completed two phase III clinical trials and published preliminary results. For their HTA submissions across the globe, they needed economic evidence to show the benefit of their new product compared to current treatments across different markets. This global model was intended to provide a framework for future HTA submissions in other markets and to inform decisions regarding product uptake. The main challenge was to accurately reflect the HIV landscape, which included several different treatment combinations across all markets. A critical review of recent economic evaluations of treatments for HIV. Review of the client’s phase III trial results and inclusion criteria to inform the patient population. Development of a patient flow diagram to reflect the targeted patient population. Inclusion of drop-down lists for all potential comparators to be included in the model. Development of a flexible global budget impact model with direct costs (including generic uptake and optional resource use costs). Provision of utility for users to change the time horizon, currency and country to suit the different HTA requirements across the globe. The preliminary results of the model showed our client’s innovative product would have a relatively small impact on the budget of the base case market. 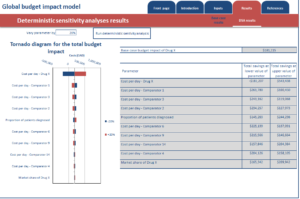 A deterministic sensitivity analysis assessed the uncertainty in the results and identified the parameters which were likely to impact the overall budget. The global budget impact model demonstrated the minimal impact likely to be incurred through the adoption of our client’s innovative treatment and provided insight into how the different costs were likely to affect the final budget impact results. The model was easily adaptable for other markets, with flexibility to alter the competitors from a selection within the base case model. The model was used for a HTA submission in Canada and was then easily adaptable for a submission to NICE.